Kosherfrugal.com - Frugal Living in Israel: On Sale Now - Reveal Games! On Sale Now - Reveal Games! Reveal Israel, the family card game about Israel, has 3 different ways to play - making this a really great deal packed into a teeny little box! For ages 3-100 and up to 18 players. 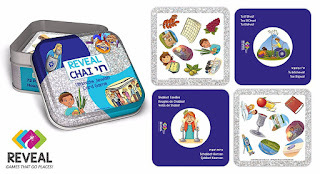 Reveal Chai, the new card game about Jewish Life, has 3 different ways to play - so it's also a really great deal packed into a teeny little box! It's multilingual (English, Hebrew, Spanish, Dutch, German and French) and is great for all ages, but especially great for kids aged 3-10 -- because there's no reading required. Right now, when you buy these games on Amazon (this seller only), you can take advantage of this special offer: Buy 1 Get 1 FREE with code 4LJ9T3TL -- but only while supplies last, or the end of July! So hurry! Whether you are buying these games as a gift for someone (this is a great way to get your family hooked on Israel as much as you are! ), or you're sharing this deal with your friends and family in America, make sure you all hurry and take advantage of this discount, and share it with your friends! Save Big On your Next Day Out! Awesome Discount on the New York Pass! Discount for Dorm Supplies Inside! Deals for Your Day Out! Subsidized Eye Exams are Back! Awesome Groupon Deals This Week!